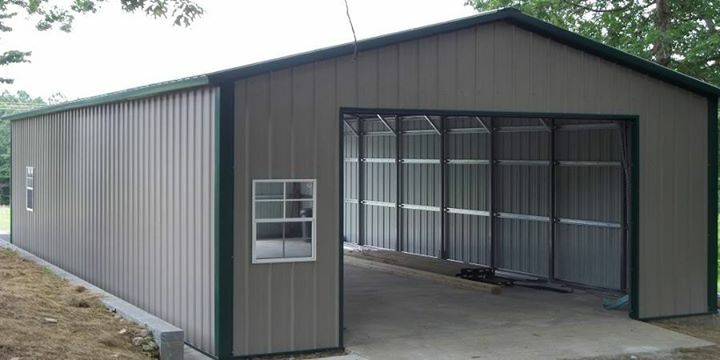 As with all of our metal buildings, our metal garages can have a standard roof, boxed eve roof, or our vertical roof system. For a quote or for questions give us a call at 434-907-9114. Use the video above as a reference for the different roof systems that we offer on our metal buildings. Our regular roof system comes standard on our steel garages, its rounded at the eaves and has panels that run horizontally across the surface of the roof. Our boxed eve roof system that comes on our metal garage buildings is an upgrade from the regular roof system, it has boxed eves and an A-frame style roof, it too has roof panels that are ran horizontally along the surface of the roof. The Vertical roof system is the highest quality roof system that we offer on our steel buildings, the vertical roof system is boxed at the eaves, has an A-frame stye roof and has roof panels that are aligned vertically along the surface of the roof to allow rain, snow and debris to easily fall off the surface of the roof. When choosing side panels for your steel garage, we have two options to choose from. Horizontal or vertical. Both are made from 29 gauge panels. The Horizontal panels come standard on the metal garages (panels are horizontally oriented along the side of the garage). The vertical panels are an upgrade on the metal garages, on this option the panels are vertically oriented along the side walls of the building. Use the pictures below as a reference. Also, another option for side wall panels is to have a color match wainscot effect (this is where the bottom portion of the side wall panels matches the roof color). The picture above a garage with Horizontal (standard) side wall panels as indicated by the arrow. The picture above is a metal garage with Vertical side wall panels as indicated by the arrow. 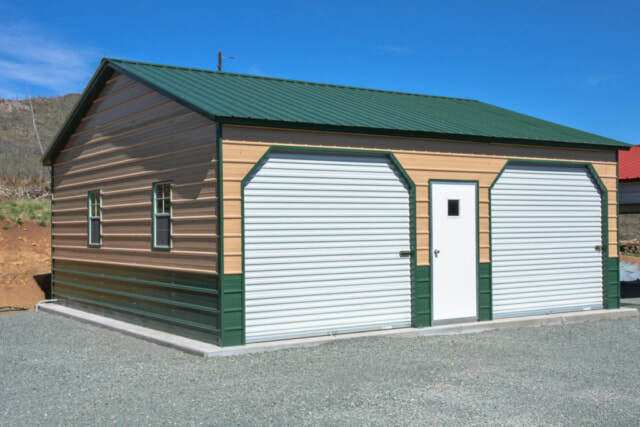 All of our metal garages are fully customizable in length, width and height options. If your not sure on the appropriate size that you need your garage to be, just give us a call and we will be happy to go over the size options that we feel most appropriate for your needs. Also, our buildings have a 3/12 roof pitch, so the center height of the building is anywhere from 2'-3' taller than the side height of the building. Use the picture below as a reference. You can add Roll up doors, Walk through doors or Windows to your metal garage. If for any reason you do not want our roll up doors, walk doors or windows, we will provide a trimmed frame out for you to install your own. When it comes to our garage doors, we can also add a 45 degree trimmed frame for a cleaner looking garage door opening. Refer to the pictures below as a reference. The above image shows the available 45 degree trim kit that we offer on our roll up doors. The trim kit forms the 45 degree angles at the top corners of each garage door. The above image is of our standard walk through door. The size of the door is 36"x80" and has a 10"x10" Window. If you would like to add your own walk through door instead of our standard door, we can add a trimmed frame out for you to provide your own door. The picture above is of a building with a standard window that we provide on the metal buildings. When choosing a window for your building, we a few standard sizes to choose from. The sizes of the windows vary some by the location that your building is going to be installed in. The first is a 24" wide x 36" tall window. The second window is a 30"x30" Window. The third is a 30" wide x36" tall window. If you would like to add your own window instead of one of our standard windows, we can do a window frame out for you to provide your own windows as well. Just let us know what city and state your wanting us to install your building in and we will let you know the available standard sizes for your state. All of our metal garages can accept a leant on either side of the building (lentos cannot go under gable end). We offer lento's ranging in width from 9' wide to 12' wide. The height of the leanto must be at least 3' shorter than the side wall to maintain an appropriate roof pitch. Refer to the photos above for a visual of what our lentos look like. Lentos on our steel buildings can be fully open (like the first picture above, partially enclosed (with one or two walls enclosed) or fully enclosed (like the bottom picture above. We offer two different types of insulation options that we will install on your metal building. The first option is a standard bubble insulation, it is a bubble layer with a vapor barrier on one side and a foil layer on the other, it has an r-4 value and runs $1 per square foot installed on the building. The second insulation option that we will install on your metal building is 2" fiberglass insulation, it has an r-13 value and runs $1.50 per square foot installed on the building. 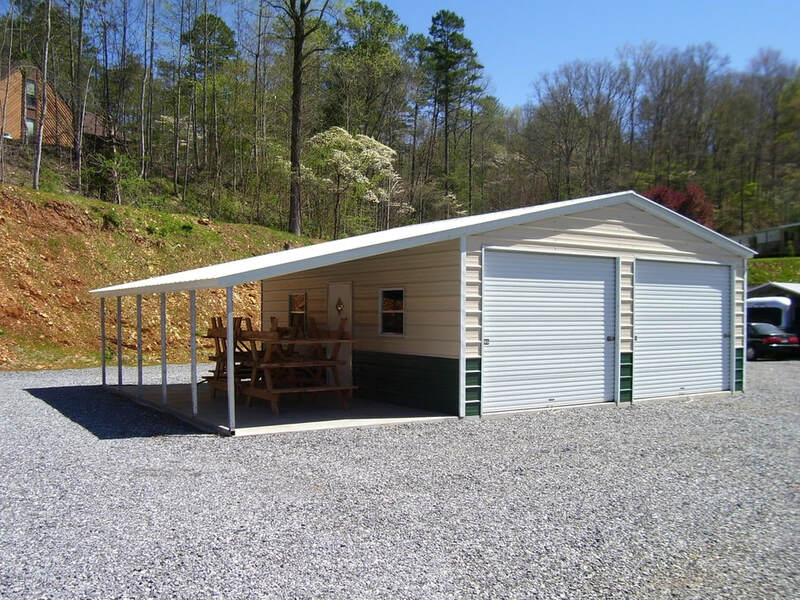 Our Metal Garages can be anchored on the ground, gravel, asphalt or concrete. If your getting us to install the Garage on the ground or gravel, the building comes standard with re-bar anchors, however we recommend our mobile home anchors, which anchor the building firmly to the ground using mobile home anchors. 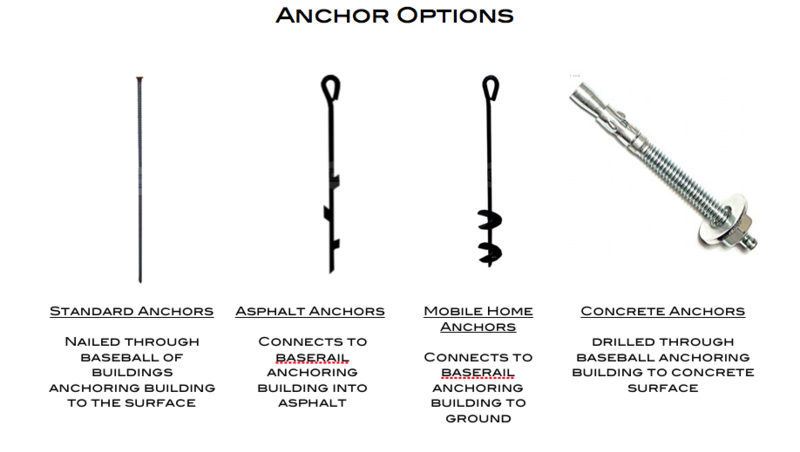 If your anchoring the Garage to asphalt, again the building comes standard with re-bar anchors, however we recommend upgrading to our asphalt anchors which are designed to anchor the Garage to your asphalt surfaces in a way that is very similar to the mobile home anchors but the asphalt anchors will not leave a large hole in your asphalt. If your looking to have us install your Garage on concrete, concrete anchors come standard with our metal carports.